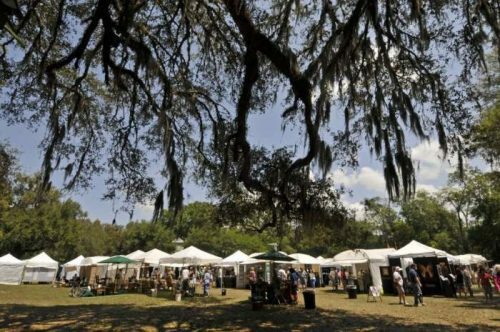 The 51st Annual Mandarin Art Festival will be held Easter weekend, April 20 and 21, on the grounds of the Mandarin Community Club at 12447 Mandarin Road. The family-friendly event serves as the premier fundraiser of the Mandarin Community Club, a non-profit identified as the oldest civic organization in Jacksonville, with proceeds supporting the Club’s preservation, education and beautification efforts throughout the Mandarin community. Free parking and shuttle service is available from Albert Field at Orange Picker and Brady Roads and at the Mandarin Masonic Lodge on Loretto Road. This is an outdoor, rain or shine event, but no pets, please. A $2 donation per person is requested at the gate. The largest community event in Mandarin, the Mandarin Art Festival has been an Easter tradition for generations of families. 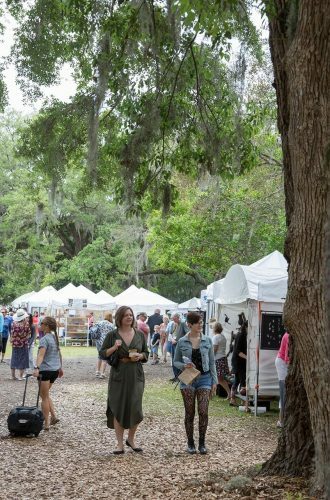 Over the years, tens of thousands of guests have strolled under the oaks of the historic Mandarin Community Club to peruse the artwork of more than 100 local and nationally-known artists working in a variety of media. A juried fine art show, awards will be given in the categories of Functional Fine Craft, Jewelry, Mixed Media, Painting, Photography, Sculpture and Best in Show. The Festival, this year, welcomes guest judges Hope McMath of Yellow House and local, award-winning artist Ted Head. The Children’s Art Show, a beloved favorite of Festival patrons, will proudly display the creations of talented students from area elementary and middle schools and is proudly sponsored by Weaver and Stratton Pediatric Dentistry and Orthodontics. Other features include a Green Market of unique locally sourced and made items, a Bake Sale with homemade goodies from the kitchens of Club members, Food Vendors providing an array of cuisine and a Chance Drawing for items contributed by Mandarin area businesses. Live entertainment will be provided and the historic, 100-year-old Post Office and General Store will be open and manned by the Mandarin Museum and Historical Society so that guests may stroll through its doors and back into history. Supervising Chair Susie Scott and Assistant Chair Ellen Milligan lead the all-volunteer Mandarin Art Festival planning committee. The Festival is made possible, in part, by support from VyStar Credit Union, BRC Roofing, State Farm Agent Jim Register, Vintage Arts, Inc., Voyage Chiropractic and Weaver and Stratton Pediatric Dentistry & Orthodontics. For more information visit www.mandarinartfestival.org.